I know! I am a lucky girl! 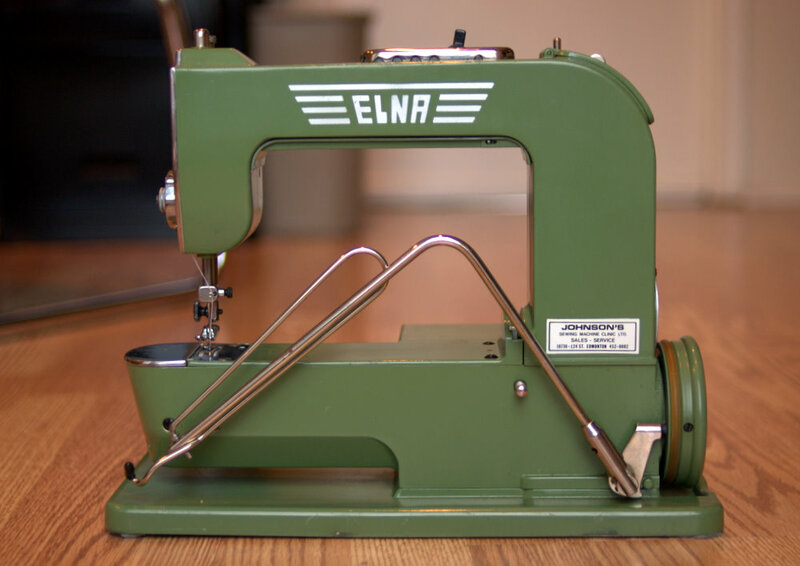 🙂 My last secret sewing machine purchase was an Elna Grasshopper! I am sure that many of you have heard lots about it. I myself had been crazy for one ever since I saw Peter’sin his multiple sewing-machine-collection-show-off blog entries (ok, maybe only three, but it felt like ten, I swear!). And! It seems to be rumored to have one of the best straight stitch ever. I snatched one from ebay one day, and it arrived at the house with 5 layers of packaging, and worked perfectly! The only issue was that I smelled a little smoky smell while operating it, but it probably just need some oiling. I love how green and small and cute it is. I had always had trouble sewing sleeve hems on my other sewing machine, so its small narrow arm is a great excuse for me to get my hands on this one! Also, I love that this machine is knee level operated instead of foot petal, which ergonomically makes so much more sense. If you live in the bay area and are drooling for one as well, I saw one for sale on craigslist for the last few days for a really really reasonable price. I wish I had waited just 3 more days to get this one locally! I had been watching craigslist for monthes for this machine, and the week I gave up and got one on ebay, this machine showed up and were unsold for weeks! daaarn! And it didnt help that my attempt to make coat 116 failed. I decided to use the gray striped material — the black square coating material felt too stiff, while the purple square material felt too soft. This one was a good weight for it. However, I forgot to cut one piece, and there wasnt any materials left by the time I realized that! However, that didnt matter, because after I pinned the pieces together to get a look, it looked like my graduation gown!! A closer comparison between the two patterns made me realize that this is indeed a copy of a graduation gown, just without the gathering. So I am giving up on this. Luckily, the pieces are pretty big, so I can probably salvage a fitted jacket from this coat later. This entry was posted on Sunday, August 29th, 2010 at 7:55 pm	and posted in hardware. You can follow any responses to this entry through the RSS 2.0 feed. Can’t wait to see those dresses! It looks great. Yeah, I roam CL, but I can’t buy any of them due to absolutely no room for them. But you’re talking about the Elna being sold in downtown SF? What I really want off of CL though is a Singer 1935 model sold in SF. I drool for that one. Congrats to you to having the space for another machine ^_^, great purchase. aww! the elna is in los gatos, south bay. its too bad you dont have more room! I am lucky enough to have a nice sewing room 🙂 dont you love old sewing machine that works? 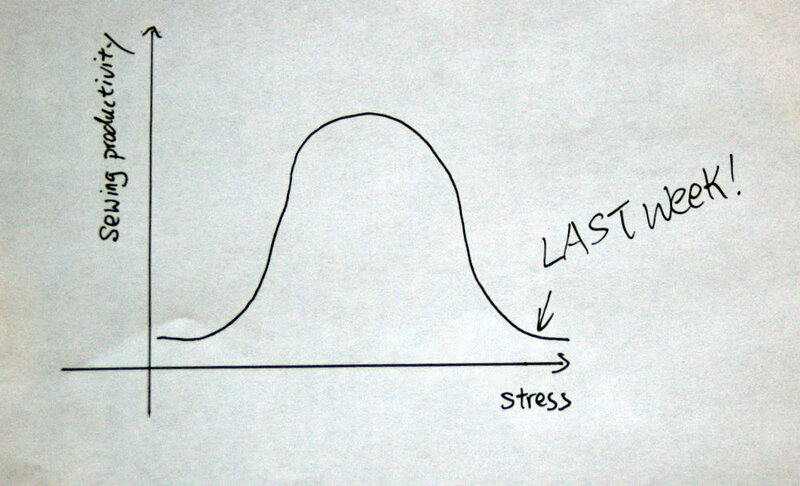 What were you stressed about? Are things better now? hehe, just work and busy weekends! when i dont make progress on a bug, i get super frustrated and stressed! That Peter guy has a lot of nerve is all I can say! Enjoy your lovely grasshopper!